Essay’d 2: 30 Detroit Artists follows the welcome reception of last year’s Essay’d: 30 Detroit Artists in presenting short, illustrated essays about artists who live and work in Detroit, or who have participated in the Detroit art scene in an important way. Stemming from the popular website of the same name, the first volume of Essay’d sought to introduce readers, even those who are well versed in the Detroit art ecosystem, to new insight and a fresh perspective on the city’s contemporary art practitioners. The four arts writers behind Essay’d—a professor, a gallerist, and two critics—are joined in Essay’d 2 by a handful of guest writers, whose unique views offer different points of access to Detroit’s diverse and populous artist community. Essay’d 2 offers thirty new profiles of artists both well known and under the radar, seasoned and emerging. Advancing the argument that there are as many kinds of Detroit art as there are individual artists, the authors write about work created in a wide range of media, from painting, photography, ceramics, and textiles to performance, installation, and architectural intervention, produced in a kaleidoscopic array of individual styles. Some of the artists this volume highlights include S. Kay Young, an attendee of the College for Creative Studies with a thirty-year photography career; multimedia artist Adam Lee Miller, who is one half of the band ADULT; fiber artist and 2015 Kresge fellow Carole Harris; and master staff carver / mosaicist David Philpot. While Detroit has long been home to a storied and industrious community of artists, there has been relatively little writing that explores, analyzes, and contextualizes their work. Now, with renewed regional, national, and international attention being paid to Detroit and its creative culture, it is more important than ever that the evolving and vital work of the city’s artists be documented and made known to the wider public. The new essays collected here, written in a format that is at once in-depth and accessible, continue the authors’ ongoing mission to introduce the Detroit art community to the world, one artist at a time. Art lovers and regional history buffs will appreciate this continued conversation. Dennis A. Nawrocki serves as adjunct faculty in the Department of Art and Art History at Wayne State University. Author of Art in Detroit Public Places (Wayne State University Press, 2008) and a freelance critic, Nawrocki has penned reviews for a wide range of publications including Art in America, Metro Times, and Sculpture. Steve Panton is the founder of 2739 Edwin and 9338 Campau galleries and co-founder of the Hamtramck Neighborhood Arts Festival and the Free School of Hamtramck. His personal interests are in interdisciplinary projects at the intersection of pedagogy, research, and exhibition making. Matthew Piper has been covering the Detroit art scene since 2011, when he served as the inaugural KnightArts Detroit blogger. His writing and photography have since been featured in Bad at Sports, Detroit Research, Infinite Mile, and Model D.
Detroit’s prolific artistic production never ceased with its industry. Knowledge, ingenuity, and stimulation has a rhizomatic growth throughout its art scene, and Essay’d astutely placed confidence in the collective. This compilation is a testament to the Detroit imagination, a contemporary art history written by the people who live it. 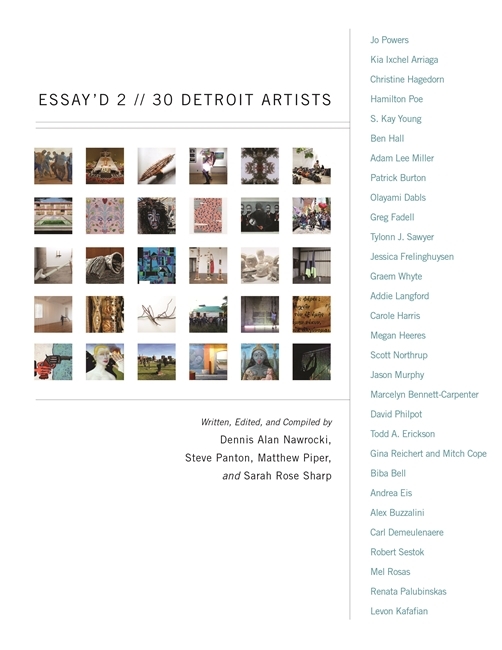 Essay'd 2 expands the tactile encyclopedia of artists living and working in Detroit today that volume one began last year. The Essay'd project provides the Detroit arts community with a much-needed documentation and examination of the artwork produced in the city. Many of these artists have exhibited at the N'Namdi Center over the years, and it's great to see them featured in this collection of writings. If you are a fan of Detroit and its artists, you need this in your library. Essay'd has achieved something remarkable: amidst the burgeoning art scene of Detroit, Essay'd has created an organic and conceptually accessible inventory of artists and practices (performance, ceramics, sculpture, sound, music, photography, painting, etc. ), and done so in a way that ensures that these artists and practices are anchored in the history of the art of the recent past in Detroit. These volumes will become a starting point for work on the contemporary scene in Detroit. The team of writers at Essay'd have done a remarkable job of identifying some of the most exciting artists working in Detroit today. They make an effort to represent artists in a range of media. Their format of short essays accompanied by a collection of images allows for insightful writing that does not get bogged down in theory and artspeak. Essay'd remains one of the best windows on the current state of visual art in Detroit that one can find. An exceptionally vivid, kaleidoscopic examination and survey of many of the freshest, creative contemporary artists of the metropolitan area.